Shirin Ebadi,56, an Iranian lawyer, writer, and university lecturer little known outside her country, was awarded the 2003 Nobel Peace Prize for championing the rights of women and children in Iran. With the announcement made in Oslo on October 10, Ms. Ebadi became the first Muslim woman to win the worlds most celebrated prize for promoting peace. In awarding the prize, the Nobel committee called Ms. Ebadi a "courageous person" and said it wished to prod the Muslim world into recognizing that Islam and human rights could go hand in hand. It also hoped to embolden the struggling reform movement in Iran at a time of widespread turbulence and upheaval in the Middle East. Shirin Ebadi (SHEE-REEN eh-baw-DEE), who said she did not even know she had been nominated for the Nobel prize, was on her way to the Paris airport to catch a plane back to Tehran when she heard the news on the radio. At a quickly called news conference, she immediately tested her newfound acclaim by calling for the release of political prisoners in Iran and cautioning the United States not to intervene in Irans domestic affairs. "Today many people who fight for liberty and democracy are in prison, and I hope for their release as soon as possible," Ms. Ebadi said. "I call on the Iranian government to respect human rights and I hope in the future things will move positively." In a pointed critique of the United States, which accuses Iran of secretly working to develop nuclear weapons, Ms. Ebadi said outsiders had no right to meddle. "The fight for human rights is conducted in Iran by the Iranian people, and we are against any foreign intervention in Iran," she said. She also underscored the selection committees central point in making her a Nobel laureate. "There is no contradiction between Islam and human rights," she said. "If a country abuses human rights in the name of Islam, then it is not the fault of Islam." Iran, a nation of 66 million Muslims, is in the midst of a power struggle between Islamic conservatives and reformists, led by the embattled president, Mohammad Khatami, and is under intense international scrutiny over the question of nuclear weapons. Ms. Ebadi has spent three decades fostering a dialogue between hard-line conservatives and reformists. In the first official reaction, Abdollah Ramazanzadeh, spokesman for Irans reformist government, said, "In the name of the Islamic Republic of Irans government, I congratulate Dr. Ebadi." European leaders appeared jubilant over the selection of an Iranian woman who works as an advocate for human rights. President Jacques Chirac of France called her an "exceptional choice," and Chancellor Gerhard Schröder of Germany celebrated her dedication to "tolerant coexistence and an understanding between cultures." In Washington, spokesmen at the White House and the State Department applauded the recognition for Ms. Ebadi, with Scott McClellan, President Bushs spokesman, saying, "She has worked tirelessly and suffered at the hands of the clerical regime, including imprisonment, for promoting democracy and human rights in her country. And we congratulate her on this well-deserved honor." Many ordinary Iranians and the countrys intelligentsia consider Ms. Ebadi a symbol of courage and persistence. Most independent rights advocates in Iran have been forced into exile or into silence. "Ms. Ebadi was an icon for defending the weakest in society but she always adopted lawful and peaceful means," said Alireza Alavitabar, a reformist politician in Tehran. While the status of women and children in Iran has improved in the last five years, basic law does little to provide for their protection and equality. A woman needs the permission of a husband or father to work or travel abroad, a mans testimony in court is given double the weight of a womans, and women must surmount numerous legal obstacles to obtain a divorce. Women do make up a sizable part of the work force, more than 30 percent by some estimates, and the majority of students enrolled in universities. Ms. Ebadi was one of the first Iranian women to be made a judge, a position she was forced to give up after the 1979 Islamic revolution barred women from the bench. As a lawyer, she has made a habit of defending dissidents, their relatives, and Iran's women. She has written numerous articles and books, including one titled History and Documentation of Human Rights in Iran. Ms. Ebadi will receive $1.32 million in prize money and is expected to collect the award in Oslo on December 10. The following is a speech given by chairman Jim Stoffels at an observance of the U.N. International Day of Peace, Sunday, September 21, 2003, in Columbia Park, Kennewick, Washington. "'Peace, peace,' they say, when there is no peace." Things haven't changed much in the two-and-a-half thousand years since those words were written down by the prophet Jeremiah (Jer. 6:14; 8:11). With so much talk about peace these days, there is so little of it. Why? Because, as we well know, talk is cheap. And too many of us Americans want a cheap peace  a peace that doesn't cost us anything personally. Even if we shell out another $87 billion, incur the first half-trillion-dollar deficit in history, and accomplish our objective, it will still be a cheap peace. Because it's easy to try to buy peace with money, especially when it's our children's and grandchildren's money that we're borrowing. But the best money can buy is a cheap peace  one that doesn't involve any cost to our personal self. The personal cost is heavily borne by our troops  especially those who come home in bodybags  and their families. But their sacrifices are not enough to bring enduring peace. There are sacrifices and hardships that 292 million of us Americans must bear to achieve an enduring peace. Our war in Iraq was sold to us as part of a war on terrorism. But we don't really have a war on terrorism. All we have is a war against terrorists  a purely reactive measure in the aftermath of September 11, 2001. To have a real war on terrorism, one we could have any hope of winning, we have to address the root causes of terrorism. And that's a price too many of us  including our President  don't want to pay, because it would require us to face the reality of our own participation in evil-doing as a nation.
"' Peace, peace,' they say, when there is no peace." We are not a country at peace with the world. Are we, individually, at peace with ourselves? If we are people who search for meaning, for truth, for God, for peace ... in our personal lives, where do we find that? Only in reality. We cannot find God, truth, meaning or peace by escaping into drugs or alcohol. Neither can we find God, truth, meaning or peace by escaping into a fantasy world of wishful thinking and denial. Only by facing the sometimes harsh realities of our lives can we find God, truth, meaning, and the healing that brings peace. Likewise for us as a nation. We cannot find peace by escaping into a fantasy world of denial and wishful thinking in which the United States is totally white, totally pure, and it is only others who are blackened by the evil of sin. We cannot expect to have peace when we ourselves do not behave according to accepted legal and moral standards. And our pre-emptive attack on Iraq was both illegal and immoral. It was a violation of international law because it was an act of war, not of defense. The doctrine of pre-emptive military strikes is itself a direct violation of Nuremberg Principle VI, which states that "Planning, preparation, initiation or waging of a war of aggression" is punishable as a crime under international law. Moreover, 48 U.S. religious leaders, representing many different denominations  Baptist, Catholic, Disciples of Christ, Episcopal, Lutheran, Mennonite, Methodist, Orthodox, Presbyterian, Quaker, Reformed, Unitarian, and others  sent a letter to the President stating their judgment that it would be morally wrong for us to take pre-emptive military action against Iraq. The world's lone superpower may be able to force it's will on the rest of the world, but might does not make right. When we demonize others as evil and present ourselves as the savior of the world, we are out of touch with reality. Evil has neither an "empire" nor an "axis" but is universal to the behavior of every human person and, consequently, every human institution  including "we the people of the United States." Many root causes of terrorism can be found in the foreign policies of our country over the last half-century or more. We have to pay the price of facing that reality  the reality of our own evil-doing as a nation  if we truly want peace with the world. If we do not face that reality, then we can never do the hard work of reconciliation that is needed to bring healing into our relationships with others around the planet. And without that healing, there will be no peace on Earth. Three Catholic nuns, members of the Plowshares movement founded by the late Philip Berrigan, were sentenced Friday, July 25 in U.S. District Court in Denver for nonviolent action at a nuclear missile silo in Colorado. Dominican Sisters Ardeth Platte, 67, Carol Gilbert, 55, and Jackie Hudson, 68, (left-to-right in photo) were sentenced to 2½ 3½ years in prison by Judge Robert Blackburn, who called them "dangerously irresponsible." Despite his strong words, Judge Blackburn departed from sentencing guidelines which call for a six-year minimum term. Last October 6, a Sunday morning, atop a hill in northeastern Colorado, the three nuns  dressed to look like weapons inspectors  cut down part of a fence at a Minuteman III missile silo, used their own blood to paint crosses atop the concrete lid, and sat down to pray. "O God," they repeated, "teach us how to be peacemakers in a hostile world." They prayed and they waited. They sang hymns and conducted a service, for which they brought along printed programs. And they waited. It was an hour before Air Force personnel arrived to arrest them. Seven months later, much of that time spent in a windowless basement jail, the three were convicted by a jury in U.S. District Court in Denver of two felonies: obstructing national defense and damaging U.S. government property. Each offense had a maximum penalty of 10-20 years imprisonment and a $250,000 fine. The nuns and their attorneys were shocked by the verdicts. Two Air Force witnesses had testified under oath that the women did not injure or obstruct national defense. Plowshares members regularly attack federal military property in largely symbolic anti-war and anti-nuclear protests, actions they contend are to prevent crimes against humanity from occurring. The nuns are all veterans of protest actions. They have been arrested so many times that they no longer keep track. They've been locked up a few days here, a few months there. This time, though, was different. This was the first time they had performed their civil disobedience in the flag-waving political climate following the terrorist attacks of September 11. This was the first time they were charged with felonies. The day the nuns were convicted in April, the U.S. military was bombing Baghdad. "I think the outcome of the trial was very much the result that we were at war with Iraq," said Susan J. Tyburski, a Denver attorney who represented Gilbert. "People think it's unpatriotic to voice any criticism of the government during wartime, unfortunately." The nuns insist they are not guilty of a crime because they believe they were following international law, which considers nuclear weapons illegal. That defense was not permitted at trial. Sister Jackie Hudson lives in Bremerton, Washington, and is a member of the Ground Zero Center near the Trident nuclear submarine base at Bangor. Sisters Carol Gilbert and Ardeth Platte both live in Berrigan's Jonah House community in Baltimore. Although they had until August 25 to report to prison, they chose to go immediately. Anti-war activist Philip Berrigan died December 6, 2002, in Baltimore MD at the age of 81. Berrigan died at Jonah House, a community he co-founded in 1973, two months after being diagnosed with liver and kidney cancer. He is survived by his wife, Elizabeth McAlister, and three children. Philip Berrigan led the "Catonsville Nine" action  which included his brother Daniel, a Jesuit priest  in staging one of the most dramatic protests against the Vietnam War in 1968 by dousing homemade napalm on a small bonfire of draft records in a Catonsville MD parking lot. The Berrigan brothers went on to co-found Plowshares, a group of activists that engaged in anti-war and anti-nuclear acts of civil disobedience. The first Plowshares Action in 1980 was a protest at a General Electric plant in King of Prussia PA, where nose cones for nuclear warheads were made. They hammered on two nose cones, poured blood on documents and offered prayers for peace. Philip Berrigan's actions put him in federal prison for a total of almost 11 years. He wrote, lectured, and taught extensively, publishing six books, including an autobiography, Fighting the Lamb's War. For his peacemaking and humanitarian work over the last 25 years, former President Jimmy Carter was awarded the 2002 Nobel Peace Prize. The Nobel committee used the occasion to send a sharp rebuke to the Bush administration for its aggressive policy toward Iraq. "In a situation currently marked by threats of the use of power," the Nobel citation read, "Carter has stood by the principles that conflicts must as far as possible be resolved through mediation and international cooperation based on international law, respect for human rights and economic development." Gunnar Berge, the Nobel committee chairman, was even more direct. The award "should be interpreted as a criticism of the line that the current administration has taken," Mr. Berge said shortly after the award was announced in Oslo. The peace prize often carries a political message, but never before has it been so pointed. Administration officials sought to duck any controversy over the Nobel committee chairman's remarks, saying they were proud Mr. Carter won the award. Mr. Carter, who was president from 1977 to 1981, won from a record field of 156 candidates vying for the prize named after Alfred Nobel, a Swedish philanthropist and inventor of dynamite. The Nobel Peace Prize, which carries a stipend of $1 million, recognizes the 39th president for his "vital contribution" to the Camp David Accords in 1978, his "outstanding commitment to human rights," his work fighting tropical diseases like river blindness, and his continuing interest in furthering democracy. Some of Mr. Carter's biggest accomplishments, the Nobel committee said, were the conflicts he prevented. In 1994, with United States warships steaming toward Haiti, Mr. Carter averted a bloody crisis by convincing a military junta to leave. He also brokered a truce in Bosnia that year and made news this spring by visiting Cuba and publicly scolding President Fidel Castro. 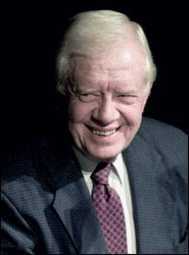 More than any other ex-president, Mr. Carter, a Democrat and former Georgia governor, has stretched the star power of the Oval Office to promote democratic values across the world. Unlike his peers, he never joined corporate boards or went on the lecture circuit. Instead, with seemingly endless energy and his signature toothy grin, he has trudged up mountains to meet with warlords, cajoled dictators into granting more freedoms, and found a second career of "waging peace." Everywhere he goes, so does his wife, Rosalynn, his most trusted confidant. Mr. Carter said he plans to use the prize money for an emergency fund at the Carter Center, the private peace-making foundation in Atlanta that he and Mrs. Carter founded 20 years ago. The Carter Center has projects in 65 countries. Mr. Carter is the third United States president to win the Nobel Peace Prize, after Theodore Roosevelt (1906) and Woodrow Wilson (1920). The peaks and perils of growing up with activist parents. What was life like for those whose parents worked on the front lines for peace and justice? While activist parents might worry about their children's alienation from classmates, the problem for their children is separation from parents. Kate Berrigan, the 19-year-old daughter of Elizabeth McAlister and Philip Berrigan, talks candidly about growing up in a radical Catholic family. Her father, Philip (along with his brother, Daniel), came to activist fame with the Catonsville Nine, an anti-Vietnam protest group that burned draft files in a Maryland Selective Service office in 1967. "I grew up in Jonah House (a religious anti-war community in Baltimore founded by her parents). But I can't talk about that time without talking about my mom. In '82 or '83, she went to prison for two and a half years." When Elizabeth McAlister was arrested for civil disobedience in the Griffiss Plowshares action at Griffiss Air Force Base in Syracuse, New York, her children felt the effects. "We were little kids," Berrigan recalls. "My older brother would lash out at people and get into fights at school. My sister just sort of withdrew into herself. And I  well, I got sick a lot." Tom Douglass, 30, son of Jim and Shelley Douglass, remembers the impact of anti-nuclear protestors outside his back door. Growing up at the Ground Zero Center for Nonviolent Action near Bangor, Washington, a group founded by his parents and dedicated to resisting the U.S. Navy's Trident submarine base on Hood Canal, Douglass found himself drawn to ethical  and artistic  pursuits. "Our house shared a fence with the Navy base," he says. "I would take pictures of the people crossing the line and getting arrested for protesting." Spending your childhood in the face of danger is less than ideal, but it has at least one advantage: You learn that fear doesn't have to have the last word. Since entering Oberlin College, where her self-designed major is Community and Critical Resistance Studies, Kate Berrigan has tried several activities that might even make Uncle Daniel turn pale. She works with the Ruckus Society, a Berkeley group that trains activists in direct action strategies. "We learn how to climb, to hang banners, to form blockades," she explains. "I've worked as a student trainer for the climbing exercises. I can see myself getting pretty involved with them." Berrigan's turn to new strategies reminds us that activists' children are not mirrors of their parents. Tom Douglass' exposure to nuclear disarmament protests, for example, has evolved into an aesthetic vision. Following an internship at Sojourners, he took a job with the Seattle Art Museum. "I'm holding a day-to-day job. But mostly I'm trying to start painting again. My paintings tend to revolve around ethical issues. I think art offers a different angle into some of the same concerns my parents hold." When asked what Jim and Shelley Douglass think of his pursuits, he doesn't hesitate. "My parents support me in whatever direction I want to take." And although Berrigan's activist philosophy resembles her parents'  respect for all life and pacifism  her commitments extend beyond Jonah House. "I've gotten involved with a broader spectrum of issues," she says. "My parents have not really worked on anti-corporate globalization movements or the School of Americas. I don't fault them for not focusing on other issues. It's just that I've been exposed to so many new options." Although Berrigan and Douglass both express strong agreement with their parents' political and ethical stances, responses to their parents' religious convictions are less univocal. Douglass has separated from his Catholic ties and embraced a questioning stance. "Religion is very important for my folks. Not as much for me. I'm pretty agnostic. Moral and ethical concerns have always felt more concrete than church." Do his parents mind? Not at all. "Some of my best conversations about religion have been with my parents," says Douglass. Berrigan calls herself Catholic  with qualifiers. "I identify with being Catholic, but the church isn't that important to me," she says. "I focus on the traditions of saints and radical activists. It's a very non-institutional Catholicism." The lessons  spiritual and otherwise  that these activists' children learned at an early age now serve them well as adults. The Nobel Peace Prize for 2001 has been awarded jointly to the United Nations and its Secretary-General, Kofi Annan. The Norwegian Nobel Committee said the award had been given to the U.N. and 63-year-old Annan for their work to build peace throughout the world. In a statement, committee chairman Gunnar Berge said: "For 100 years, the Norwegian Nobel Committee has sought to strengthen organised cooperation between states. Today the organisation is at the forefront of efforts to achieve peace and security in the world, and of the international mobilisation aimed at meeting the world's economic, social and environmental challenges. "Kofi Annan has devoted almost his entire working life to the U.N. As Secretary-General, he has been pre-eminent in bringing new life to the organisation. He has risen to such new challenges as HIV/AIDS and international terrorism, and brought about more efficient utilisation of the U.N.'s modest resources. "Through this first Peace Prize to the U.N. as such, the Norwegian Nobel Committee wishes in its centenary year to proclaim that the only negotiable route to global peace and cooperation goes by way of the United Nations." Annan, a native of Ghana, took office in 1997 and was easily elected to a second term in June, months before his first five-year term expired. A career U.N. diplomat, he has energetically begun reforming the organization's sometimes bloated bureaucracy, restoring the morale of its professional diplomats, peacemakers and aid workers, and reviving its centrality in conflict resolution. The job of Secretary General is often described as that of the world's diplomat-in-chief, charged with making peace and preventing war in situations where government-to-government diplomacy has failed. Annan has proved singularly adept on that front. Indeed, the ringing endorsements of his second term and complete absence of hostility from any quarter speak to his popularity across all geopolitical boundaries. Annan has brought a quiet but unmistakable moral leadership tempered with realism and exercised with a light touch. He has never wielded real power, and that may be his strength. His ability to effect solutions derives entirely from his powers of persuasion, his knack for showing the partisans to conflict that there is a high road, and that they are capable of taking it. Kofi Annan's response to being awarded the Nobel Peace Prize summed up why he may be the world's best-loved political power player: He said he felt humbled, encouraged, and challenged to do more and do better. "At the same time it is a great responsibility at such a difficult moment but reinforces us in pursuing the search for peace," he said. When President Bush was asked in October how Afghanistan would be remade once the Taliban had been overthrown, he indicated that the U.N. would be asked to assume that responsibility. And that is eloquent testimony to Kofi Annan's success in restoring the fortunes of a body more typically pilloried in Washington DC for most of the past two decades. The U.N. was founded in 1945 in the wake of World War II to serve as a beacon of hope that a better world can be built. It now has 189 governments as members, a headquarters in New York, half a dozen regional branches and scores of field offices, and more than 50,000 employees worldwide. South Korean President Kim Dae Jung was awarded the Nobel Peace Prize 2000 "for his work for democracy and human rights in South Korea and East Asia in general, and for peace and reconciliation with North Korea in particular." Sometimes called South Korea's Nelson Mandela, Kim, 74, is a former political prisoner who was persecuted for decades. Under two successive military regimes, he was ridiculed, harassed, imprisoned and targeted for assassination because he advocated democracy for South Korea and reconciliation with North Korea. At his presidential inauguration in February 1998, he vowed to make himself "the president of the people," a president who would "wipe the tears of the alienated and encourage those in despair." He called for a "revolution of mind," which meant, he said, "respect for each person and adherence to justice as the highest value." He also made an unprecedented call for women's rights and equality saying, "the wall of sexual discrimination in homes, workplaces and society must be removed." Born to a farm family, Kim graduated from school and launched a career in shipping. He became absorbed in politics and converted to Catholicism in 1956. He ran repeatedly for the National Assembly, finally winning a seat in 1960 after a student-led rebellion overthrew the regime of strongman Syngman Rhee. Less than a year later, Kim lost his job when Gen. Park Chung Hee took over in a coup. Kim became a full-time leader of the political opposition, which put his life at risk. In 1970, with Cold War tensions drawn taut by the Vietnam War, Kim declared his eagerness for reconciliation between the Koreas and was denounced by the South Korean government as a communist. Nonetheless, he drew 46 percent of the vote in the 1971 presidential election, barely losing to Park. Shortly thereafter, a truck rammed Kim's car in an apparent assassination attempt. His arms, legs and hip were injured; two people in another car were killed. Two years later, he was kidnapped by the Korean Central Intelligence Agency from a Tokyo hotel and nearly murdered before U.S. officials intervened. Kim spent most of the rest of the 1970s in prison or in exile. When Park was assassinated in 1979, protests broke out in the region where Kim had his base of support. Troops moved in and killed at least 200 people. Kim was arrested, tried for treason, and sentenced to death. The United States pressured the South Korean government to commute his sentence to life in prison. In 1982 he was released for exile in the United States. Kim returned to South Korea in 1985 and was intercepted at the airport by government agents, who roughed him up and then kept him under house arrest for two years. In 1987, a pro-democracy movement brought a new constitution and great political change to Korea. Kim was cleared of all outstanding charges, and his full political rights were restored. He ran for president in 1987 and 1992 before finally winning in 1997. At his 1998 inauguration, Kim reiterated his determination to do all he could to bring reconciliation with North Korea and unity to a people divided for more than 50 years. For Kim, though, it was much more than a mere political pledge. Few politicians have articulated as sincerely as he has the virtues of forgiveness and reconciliation. In a letter sent to his second son, Hong-up, in 1980 after he was sentenced to death, Kim wrote: "Only the truly magnanimous and strong are capable of forgiving and loving. Let us persevere, then, praying always that God will help us to have the strength to love and forgive our enemies. Let us together, in this way, become the loving victors." Kim would put these words into action. He forgave and granted amnesties to the two military leaders who had imprisoned and nearly killed him. Both had been tried and convicted of corruption and were serving jail terms when Kim was elected president. In an interview shortly after his inauguration, Kim named Abraham Lincoln among his sources of inspiration: "I admire Abraham Lincoln and his spirit of tolerance, forgiveness and inclusiveness," Kim said. He referred to the fact that after the North's win in the U.S. Civil War, Lincoln forgave the people of the South, saying, "With malice toward none and charity for all." Kim said, "I was able to forgive ex-Presidents Chun and Roh, who tried to kill me, because of Lincoln's influence." South Korean President Kim Dae Jung has become a universal symbol of morality and peace in the excruciatingly tense exchanges between North and South Korea. If peace prevails in this troubled region, Kim Dae Jung's spectacular efforts will deserve the lion's share of the credit. It was for his efforts toward that still-to-be-realized political goal that Kim won the Nobel Peace Prize. The greatest assembly in history of presidents, prime ministers, monarchs, and other rulers  more than 150 world leaders  gathered at the United Nations on September 6-8 for the U.N. Millennium Summit. Taking the seats usually filled by their ambassadors, the extraordinary convocation of leaders laid out the world's hopes for the third millennium and resolved action to enhance peace, development, and human rights. Following a moment of silence to remember U.N. workers slain when their headquarters was overrun by rioters in Indonesian-controlled West Timor, the leaders launched into three-days of speeches and negotiations on the world's most vexing problems. They heard U.N. Secretary-General Kofi Annan appeal for leadership to end poverty and war, President Bill Clinton appeal for help in bringing peace to the Middle East, and Russian President Vladimir Putin call for an international conference to outlaw the militarization of space. President Clinton told the Summit Israel and its adversaries "have the chance to do it, but like all life's chances, it is fleeting and about to pass." In his speech, Putin cited the 1972 Anti-Ballistic Missile treaty and referred indirectly to U.S. proposals to create a national missile defense system, which would abrogate the treaty. Botswana's President Festus Mogae pleaded for international assistance to combat AIDS: "Our people are crying out for help. Let us respond while there is time." Outside the hall, New York's streets served as the citizens' podium. In the largest demonstration, followers of the Falun Gong spiritual movement protested Beijing's crack down against the sect while others protested slavery in Sudan. At the conclusion of the Summit, the world leaders unanimously adopted a "United Nations Millennium Declaration," the gathering's main document. The Declaration contains a statement of values, principles, and objectives for the international agenda for the twenty-first century and sets deadlines for many collective actions. The document reaffirms Member States' faith in the United Nations as indispensable for a more peaceful, prosperous, and just world. The collective responsibility of the governments of the world to uphold human dignity, equality, and equity is recognized, as is the duty of world leaders not only to their own constituencies but to all people, especially children and the most vulnerable. Citing freedom, equality of individuals and nations, solidarity, tolerance, respect for nature, and shared responsibility as six values fundamental to international relations for the twenty-first century, the Summit Declaration also identifies concrete objectives that participants believe would lead to the desired outcomes. The leaders declare that the central challenge of today is to ensure that globalization becomes a positive force for all, acknowledging that at present both its benefits and its costs are unequally shared. The Declaration calls for global policies and measures that address the needs of developing countries and economies in transition. Among the objectives with the declared aim of promoting peace, security, and disarmament, world leaders resolve to strengthen the rule of law and ensure compliance with decisions of the International Court of Justice, to provide the United Nations with the resources it needs for conflict prevention and peaceful resolution of disputes, and to take action against the international drug problem and terrorism. The document also calls on Member States to eliminate weapons of mass destruction, particularly nuclear weapons, and to keep all options open for this aim, including the possibility of convening an international conference to identify ways of eliminating nuclear dangers. World leaders also made commitments to minimize the adverse effects of economic sanctions on innocent populations and to subject sanctions regimes to regular review. Among the steps aimed at development and poverty eradication, the Declaration contains commitments to make the right to development a reality for everyone. Concerned about the obstacles developing countries face in mobilizing the resources to finance their sustained development, the document calls for adoption of a policy of duty-free and quota-free access for essentially all exports from the least developed countries and an enhanced programme of debt relief for the heavily indebted poor countries. In an address delivered at the concluding meeting of the Conference, Secretary-General Kofi Annan told the Summit that it had sketched out clear directions for adapting the Organization to its role in the new century. He declared, "It lies in your power, and therefore is your responsibility, to reach the goals that you have defined." I will be a peaceful person. I will make my world a more peaceful place. I will set a peaceful example for others to follow. One hundred eighty days a year, this Peace Promise is recited by everyone at Amistad Elementary School in Kennewick, Washington, immediately after the Pledge of Allegiance in the morning. Amistad (Spanish for "Friendship") Elementary School opened in the fall of 1992. Students and teachers were drawn together from various other elementary schools to begin working together  to create a new school with a new culture. There was no history or tradition for students and staff members to draw on. We quickly found that not having a tradition was difficult for everyone. For the first two years of our existence, student misbehavior was the most pressing problem and challenge. Referrals to the office were frequent. The misbehaviors covered the range: angry children who defied everyone, children bent on exacting revenge for perceived or real hurts, foul language towards adults, and plenty of disagreements that quickly turned into fights. The office was a supplementary classroom for these children. During the first two years, there were upwards of 600 referrals to the office for disciplinary reasons. Clearly things were not going well. During the summer of 1994, several committees met to discuss a course of action. Out of those discussions came a balanced program to deal with some of the most pressing emotional needs of our children. A clear set of rules, only a few, were established that defined suspendable behaviors. We also believed that we needed to talk about peace. It needed a high, visible place in our day. During our summer work, we found a poem about peace. It was too long to meet our needs, so we shortened it to the three lines above. Now, whenever children are referred to the office for breaking the peace, our Peace Promise is used as a focus of discussion. How did it work? Over the last two years, there have been only about 150 referrals to the office  one-fourth of the amount during the first two years. Children know that peace is within their hands. Some of them may not be able to live in a peaceful environment 24 hours a day, but they can make a peaceful environment for 6½ hours a day in a place that encourages and supports peace. When children can come to school and not fear for their safety, then learning is made possible. Our focus on peace has made Amistad a much better place to be for everyone! Terry Barber (now retired) was the principal of Amistad Elementary School in Kennewick. For two years, he was voted the Distinguished Elementary Principal of Washington State. Every morning he led the Peace Promise over the school intercom.